Welcome to Whistling Pines Ranch! Our farm is located in the rolling hills between Clayton and Prairie Farm, Wisconsin, where we raise Suri alpacas. 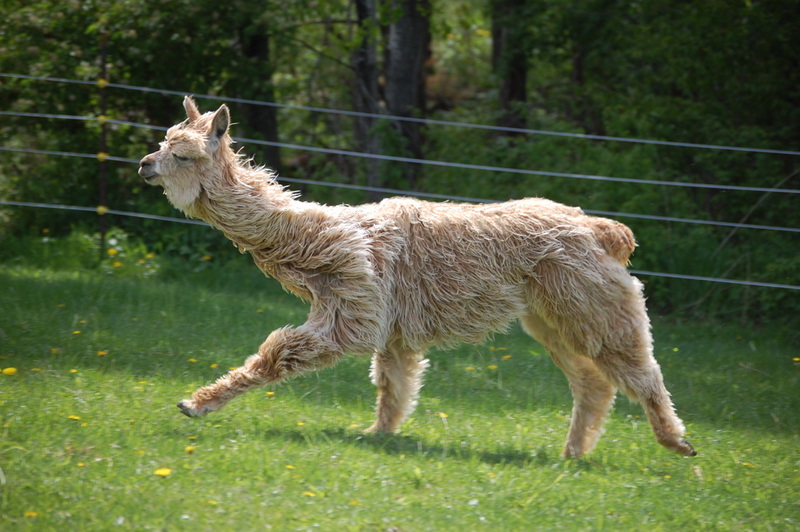 Suri alpacas are prized for their rarity and elegance, but most of all for their lustrous, silky-soft fleece. A Suri in full fleece running across a sunlit pasture will definitely grab your attention, and placing your hands in their silky fleece will make you a believer! Established in 2008, our focus is to ensure that each new generation is better than the parents with respect to fleece characteristics and conformation, and our goal is to maximize fleece density, fineness, and consistency on a conformationally-correct frame. We are home to several champion animals, earning prestigious awards at halter shows, fleece shows, and spin-offs, at both local and national levels. Within our herd, we have now developed "sub-herds" of animals with elite fiber qualities, both colored and light/white, that have set the bar for our quality standards going forward. At Whistling Pines Ranch, we place high emphasis on using objective measurements (e.g. fiber analysis & skin biopsies) to assess the quality of our animals. We also utilize the subjective assessments provided by show judges, but may place more or less emphasis in evaluating animals based on those results when factors such as class size are considered. The U.S. alpaca herd is in the growth stage, but the future is in the fiber. Having the above-mentioned tools in place not only ensures that our breeding program continues to move forward, but that our clients are getting the high-quality animals needed to move their programs forward as well, whether they are a breeding farm or a fiber farm. We also feel that there is a certain degree of predictability that we can forecast for an unborn cria, based on the traits recorded for the parents. Our animals are treated with respect, and having a small herd allows for daily interaction with the animals. We implement preventative-care measures to deter health problems from arising, and any issues that do surface are addressed immediately. We are blessed with sufficient acreage to not only provide ample pasture for our animals, but to also grow and harvest our own hay, which helps us maximize the nutritional value of our forage. Each crop is tested and we supplement with vitamins and minerals, where needed, to help the animals achieve their true potential. We were raised with strong values and we apply those values to our day-to-day interactions with not only our animals, but with clients, potential clients, and visitors, as well. We would be honored to assist you in starting or expanding your herd, be it show animals or fiber. Feel free to call for an appointment to stop by and look at the animals and/or products that we have to offer. If you desire a particular item that is not listed on our farm store page, please contact us to see if we can accommodate your request. LIKE US ON FACEBOOK AND STAY UP-TO-DATE ON ALL THE HAPPENINGS AT THE RANCH!